Each one of the 59 Tomahawk missiles fired by the US Navy, by order of Trump, at the Syrian air base in Homs cost somewhere between $800,000 and $1.4 million — per missile. This obviously expensive surge in US military spending subsequently sent the manufacturer’s stock soaring. It also sent the Free Thought Project on an investigation into the types of stocks in which President Trump invests. What we found is shocking, but sadly, typical. 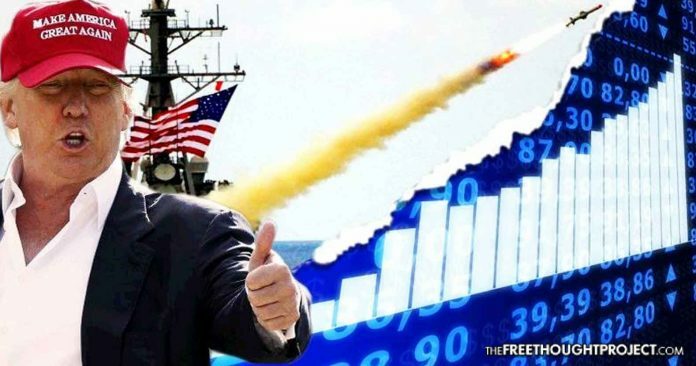 However, some may not be familiar with the fact that according to the President’s most recent FEC disclosure, the Trumps actual own or have owned stock in Raytheon. That’s right, the 59 missiles, that Trump hurled at Syria — which cost taxpayers somewhere between $47 million and $82 million — could’ve actually turned a profit for the president.